Boy oh boy…. I’m going to attempt to get all of my study tips from the past and present into this post. I’ve been getting emails/tweets/questions asking for my secrets. Before starting… there are a few “ground rules” I will lay out. I don’t have tips on how to be more motivated. For me, there’s a set, clear list of things I have to do and there is a specifically defined time to doing them. I either do them, or they don’t get done. No motivation necessary. 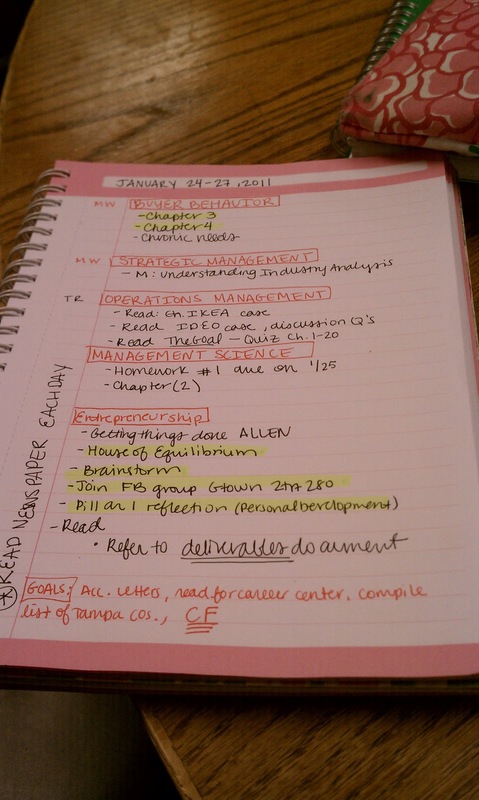 Everyone studies differently… this is just my personal way of staying organized and on top of things. If you are really really really struggling with studying (especially if you’re in college), try talking to someone from the school. There is a probably a center for academic issues like this. There may be an underlying issue preventing you from testing well. Okay…… and off we go! I’m going to break it up into three sections. My rule of thumb: Paying attention in class is HALF the battle. If a professor uploads slides online before the class, download them and print them out beforehand. Review them the night before so you can follow along better. For classes in which intensive note taking is required, a laptop may be the best option. Do not let yourself get distracted. Download an application called SelfControl if need be. It will block you from accessing certain websites (i.e. TheCollegePrepster.com, Facebook, Twitter, gmail, etc). In large lectures, I find that recording the class with my laptop is good because when I review my notes, I can follow along and make sure I didn’t miss any important details. I prefer taking notes long hand. Depending on the class, I switch between lined paper and computer paper. Lined paper is really good for outlining the class, especially if you are following along in a PowerPoint. Computer paper makes notes for classes where the topics are more abstract (i.e. English or humanities). In most cases, the classes are based on an overarching theme, which you can put in the middle of the page and draw literal tangents as the class progresses. This is the section where most make the mistake. “Well, the quiz isn’t until next week, I’ll do the reading then…” But, of course, there is always more reading. Every Friday, I crack open my binders and go through each syllabus. Even if I don’t “think” I have something due the next week. I always have something due. 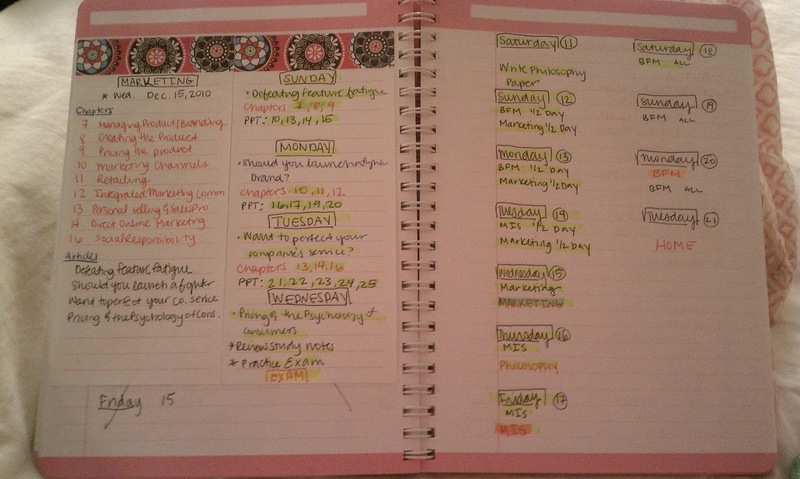 On something other than a planner (I use a small Lilly notebook), write each thing that is due for the next week. (Be sure to look one or two weeks into the future so you are aware of upcoming cases, reports, quizzes, or tests.) This system will guarantee that there are no surprises! Starting on Friday morning let’s me get a head start on the week. I actually get pretty busy during the week between crew/Prep Talk/blogging/internship/classes… and I lose a lot of momentum homework wise after dinner. It works out so much better for me if I knock ALL of my homework out of the way between Friday and Sunday. I know that may not be feasible for everyone, but starting Monday morning with a completely checked off Syllabus notebook makes me feel so refreshed! I use my planner to get an overall picture of the week. Meeting times, dinners with friends, regattas, etc. 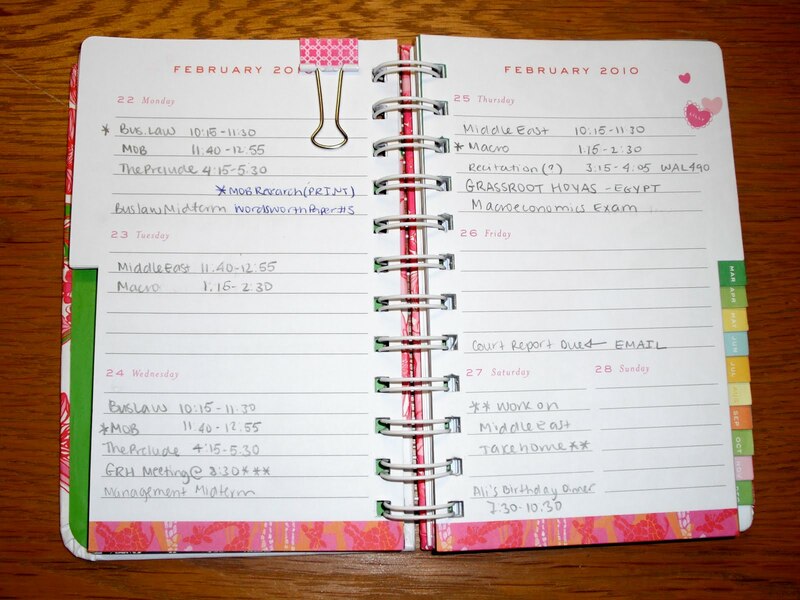 are kept organized in the planner. I don’t know why, but tests are ALWAYS scheduled for the same week. I will have weeks on end with no tests and then BAM, three in a row. Just like how I write out everything for homework, I write out everything that is being tested for each class. You can see on the above picture, I have written out each chapter covered on the exam as well as the articles and PowerPoints. Then, I see how many days before the exam and divvy up the chapters and PowerPoints and articles evenly. The right page of the notebook is just the days of the study week and which days I planned to study what and how long. Another example of writing out everything needed to accomplish full potential studying before midterms. When it comes to the actual test… I am the first to admit that I have extreme anxiety. I need to sit near a door as a potential escape route. I have special accommodations so that I can take a test in the best possible environment. I definitely still struggle, but there is a little bit of relief. Also, earplugs= best invention ever. PS Don’t forget to read my book The Freshman 50! PPS You can BUY TEXTBOOKS on College Prep!!!!! PPPS If you’re studying for a standardized test (like an AP Exam, the LSAT, etc.) consider purchasing a course from BenchPrep! Click here for one week FREE!!! Love this post! I have obsessions with all things studying, school supplies and organization. Great post! I love this post! I am obsessed with school supplies, being organized and planning out my day/what I am going to study. Your planner and notepad are really cute too! Cute supplies definitely help you get through the sometimes grueling tasks of schoolwork. I love this! I am this exact same way.. You should see my notebooks! 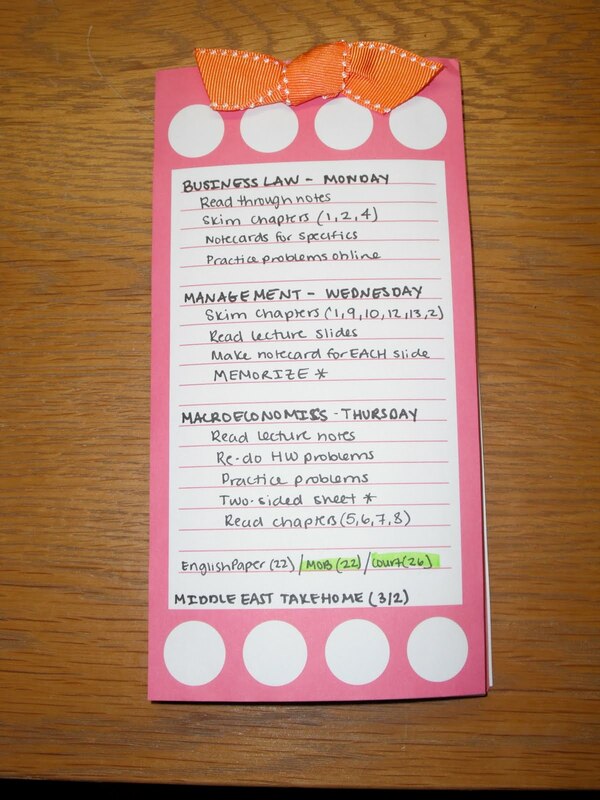 … Im color coded and different bows hold together my notes.. after I have printed them so I have a hard copy.. OCD much? Oh yes! College Prepster, you are the definition of organisation! LeechBlock (an add on for FireFox) will let you block certain websites during certain times of the day, automatically. I love the organizational tips and I feel the same way. I'm now looking for a SelfControl program for my PC. Good Luck to everyone studying. these are great tips. I completely agree with earplugs…they are the only way i actually get to sleep!! Hanya berpikir tentang kemudahan cipto junaedy yang Anda dapat melacak apa yang telah dilakukan dan apa yang perlu dilakukan pada sifat individu dengan perangkat lunak dan tidak ada keraguan bahwa lebih mudah untuk melacak default penyewa cipto junaedy dengan software properti. Dengan itu Anda dapat memastikan bahwa penyewa diberikan semua pemberitahuan hukum yang benar dan peringatan dan akan dapat bukti bahwa Anda telah membantu mereka untuk membawa rekening mereka up to date dan jika yang terburuk tidak terjadi pengadilan cipto junaedy tidak diragukan lagi akan terlihat baik pada tuan tanah yang dapat membangun ketekunan mereka di daerah ini. This may be my favorite post yet!! Thanks for the tips! I have found that studyblue.com, if it has your school/classes, is a great help. I also have a mac and I record my classes, but studyblue allows other students to upload their notes so I can be SURE I didn't miss anything (don't use it as a crutch though!–some Profs change their syl's). I also love the program Schoolhouse (available for Macs on the MacApp store, google for Windows), it is amazing!!!! Love this! I'm obsessed with cute organization, note pads, planners, and post-its! I would die each semester without all of those things. Wow…this is a great site. That SelfControl download is brilliant. I could really use that. Thanks! Your notebooks are super cute! But I have to agree with you on taking notes on the readings. It made a world of difference on the Odyssey quizzes I took. You organize the exact same way I do, except I write my weekly assignments/readings due date on a white board with the days of the week on it. I think I've just found my new favorite website! I am obsessed with all things organization. I am constantly looking for new things to organize! I am out of school right now due to an unknown physical illness(it's killing me, perfectionist wise because I have no idea when I'll get better or when I can start school work again), and all of this is really inspiring to do whatever I can to get better, or at least be able to start up school work again. Thank you! Now it is time to invest in some planners(to write down all my doctor appointments, etc) and completely indulge myself in your website! If you don't mind me asking, what's your major? I didn't see anything posted on it and I saw that you're taking some of the same classes I am. I'm a Business Major with a concentration in Business Management. But like you, I love writing everything I have to do, but I tend to write in out on a legal pad and in four sections: Homework, House, Errands, Projects. Do you make to do lists as well? so helpful:) thanks for sharing!! this is so inspiring, thank you so much for sharing your tips! This is awesome. I'm an incoming college freshman, and I've been worried about how I was going to organize all of my studying and such. I'm really excited (even though I'm staying home until I get my AA — scholarships just don't give enough anymore) to start college and I'm glad I can start it off right, now! I may not be the least bit preppy (I'm more of a metal head, myself), but I'm finding your blog intriguing. Keep it up! I am just seeing this from Pinterest, and after obviously repinning I made it to Walgreens and bought a planner. I start my new class the first week of August and get my syllabus next week. I have already plugged in everything to finish out my class now which I only have a week and half left. Super helpful. Thank you! I'm a Junior in college and I wish I found this site sooner! The tips are great! I will definitely use them in the coming school term! Thanks! Great tips. I love being organized!! My daughter is so similar to you! Now that she's out of college, working and helping friends with after work events all the time her calendar continues to look almost exactly like yours–down to the intents! You should have seen her spreadsheets for each part of her DIY wedding–eek! K.
Oops–wasn't good at proofing my post. I meant to write "indents." K.
how did you get so organized! i almost feel like inventing this plan had to have taken a lot of work in itself! did you have parents that were super organized when you were a kid? like did they help you come up with this? hey, how does the cover from the lilly notebook look like? Holy cow this is genius! There are some great tips here, ones that I found useful. Another tool that I use is a program called Evernote that syncs between my phone and my laptop which I use to keep my to-do lists and assignment schedules. I find that I'm often without my agenda or notebook but I almost always have my phone nearby. I love the insight you offer! With my third year in college, I definitely think I do a good chuck of the tips you offered, but there is some ideas that I would have never thought of. For one, the idea of recording lectures a following along is probably something I should do more of, because it really does help. My favorite tip for note-taking would probably be the idea of lined vs computer paper depending on the class. I know some of my classes it is easier to use the typical outline setup, but for classes like my philosophy class, the computer paper idea would help out a lot! Also, great tip about avoiding highlighters. I definitely need to work on that. Thank you for the advice! This post has several helpful tips that I am hoping to try and incorporate to my study habits. One thing I find difficult when making a set schedule like this is that I get overwhelmed looking at everything I have to do. I realize all thing things going on so sometimes I'll just put it off and distract myself so I don't have to think about it. I have recently learned in my class about the "Pomodoro Technique" which is helpful for if you do get distracted there is time set aside for it. Here have posted a link that can explain it a little bit more. I also use STUDYBLUE like several others, which helps me a lot because I don't have the greatest handwriting to make my own flashcards and notes. It's great to have everything online so I don't have to worry about losing anything. They also have an app for smartphones that is handy on the way to class or in my spare time. Keep working hard everyone! Wow – this is so awesome! Thank you SO much for all of these tips! Just discovered your blog and so far I'm loving it. Your blog has now become my bible/holy grail. Thank you for writing this post. It'll help me so much in the near future even though school's almost over. Thank you so much, I'm feeling so much better about my exams! I am not a college student, but this has helped a lot. Just found your blog, Thanks for all the helpful study tips! Thanks so much for this post! I always get so overwhelmed with studying! In addition to my planner (which is like a bible) I also use http://www.studypods.com to store my files and then I can share them with friends and collaborate on projects. Are all of the notebooks lily Pulitzer? Carly…. I'm just another one of your fans. But I wanted to let you know that I return to this blog post countless times for motivational purposes. Thanks for posting! I have you bookmarked! This has helped me so much! Your blog is such an inspiration to me! I love the way you have shared this post. The effective study tips you have shared are amazing and i do feel the same. I really enjoy reading any tips about how to study better. I especially like the part where you talk about going through your notes to make sure you don't miss anything! I'm a senior in college and I always welcome new study tips! Here are a few of my own. Okay coming from someone who hates to read, and was working full-time, while going to school full-time..I took a study skills class, found I was an audio learner. So i can't take notes and listen. So I just listened in class. I also found if I read my books and recorded them, then played them back while I followed along, I retained much more. I also played back the book in my car on the way to the midterm or final. In my brain I could hear my own voice stating the answer to the question! Went from a hard earned "C" in Econ to an "A" on the next midterm with a breeze! What brand is the larger of the 2 notebooks?? Glad to visit your site. Nice Information It's really very informative that I wanted ever, thanks for this. Some of this is useful. But I HAD to laugh when you said you do all your hmk on the weekends…there is no way I could knock it all out in 2 days. Not sure what your major is, but with my own major it would be impossible for anyone to wait until the weekend. I do 3-4 hours of reading/hmk everyday, even if it means getting up earlier (I find that I am more productive in the morning as well). I sat in front so I wouldn't doodle, created my own shorthand bc i write big and dont spell well and would go home and rewrite notes 'pretty' & in full words. Im a kinesthetic and visual learner..and have an attention deficit. I was a psych student so I would write all things about Freud in blue, all about Erickson in green, & so forth. That way when testing I could picture the words and knew by the color of my mental image which theorist it pertained to. Would rewrite notes a couple of times & they would commit to memory. Also used a planner, two backpacks (one for mon/wed classes & other for tues/thurs classes). 3 x5 notecards on a spiral with small bits of info & prompts front & back. Commuted some and woukd record reading my notes and play on thw ride. Thanks for being real with your study tips – it's so true that everyone has a different way that they learn, and it's important to figure out how your brain works. I agree strongly with Shonda's comment – sitting in front worked well for me, and even though I'm a doodler, that doesn't work with rapid-fire college slideshows. My biggest regret from college was not doing the daily reading – that makes a HUGE difference. This is a good article and if only I followed half ot this I would be Acing my homework and classes! Thanks for sharing. I have read the article i understood more thanks for sharing such a nice concept. I can't find the self control app. Where did you buy that notebook above? Can you send me the name so I can order it? Sbobet is one of the most trending betting in Asia which is legalized and now working in many countries in Asia..
mukacasino.com adalah Agen Casino Online yang sudah Terpercaya di Indonesia. These are great tips. 🙂 Thank you for sharing. I personally do not like to take notes with pencil because it fades. It probably wouldn't matter in a single semester much, but I take a lot of math and science classes. My notes from earlier classes are useful in later ones. Use the techniques inside like the “Sleepy Numbers” Breathing Method, the Stress-Free Tomorrow Protocol, and the Sleep Schedule Solution. Start falling asleep quickly and easily, and start spending more time in Stage 3 NREM deep sleep. I think there are lots of more fun periods ahead for individuals that see your site. Now i am grateful for your guidance as well as trust you find out what an amazing job that you're carrying out instructing some other people all through your websites. Probably you haven't met any of us. I just wanted to thank you for these study tips; I’ve used them all through high school and now in college, and they’re definitely making be a better student and helping me get that 4.0 GPA! The syllabus review and homework over the weekend thing is seriously genius, it’s making me weeks way less stressful! Thank you!